The National Assembly was called for the 150th anniversary of the birth of Marshal Józef Piłsudski, who as de facto leader was the person most responsible for the creation of the Second Polish Republic in 1918, after it had been taken over by Russia, Austria and Prussia. On 11 November 1918, after 123 years of non-existence, Poland made its return to the map of Europe. The anniversary of the centenary of regaining independence according to Duda is the time for an “ultimate rejection of the disbelief in our own self-value and own strength”. “In this context, let us reject the false shame that has been instilled in us for years on our national history and identity,” he appealed. “Enough with the sense of dependency – uncertainty as to whether we can go our own way. Enough with the persuasion that we cannot afford our own, sovereign goals and aspirations,” he added. According to the president, “the time has come for the essence of our public life to cease to be the continuous, devastating clash of hostile tribes” and for a matter-of-fact debate among our citizens. Duda emphasised that a common, independent state is a priceless good, and that the living generation of Poles is only a depository of this good. “Poland is nobody’s property,” he repeated. Disputes going beyond borders a harm to the homeland? The Polish president also appealed not to transfer internal disputes abroad: “Disputes, often going beyond the borders of our country, do not build the position of our homeland. They mainly cause fear and aggression, a sense of hopelessness and the inevitability of internal conflict,” he believes. In his opinion, “the struggle to regain an independent state would not have been needed, if were not for the catastrophe of the partitions – the cataclysm whose direct effect was a careless and unworthy appeal to arbitration and the intervention of foreign powers. “Let’s not repeat this mistake,” Duda pleaded. Duda also stressed that one hundred years ago, the whole nation united to reconstruct and save the homeland. “The Poles followed the example of all the six main leaders that we today call the fathers of independence,” he said. Duda stressed that Poland needs armed forces “thanks to which the alliance with Poland will be a desirable asset for other countries, and the risk of conflict with it – a source of serious concerns”. According to Duda, there is also time for “full, real equality of all Poles against the law – regardless of their views, origin, material position or social status”, as well as “absolute respect for civil liberties, but also consistent enforcement of civil obligations”. The President stressed the need for “lasting, good and fair law” and “systemic order, in which the competences of the legislative, executive and judiciary authorities will be clearly differentiated”. At the same time, he explained that specific persons holding public office should have specific, clearly defined duties, for which they bear full personal responsibility. Duda also declared that the centenary of independence is a good opportunity to introduce a functional political system “suited to the challenges of the present, including the provisions of the new constitution”. “The constitution, whose main principles will be determined by the nation itself, by referendum, in a direct and unrestricted manner,” he said. “Let us also ensure that electoral procedures are more transparent, fully trustworthy,” the president added. In his opinion, “a sustainable, stable socio-economic order” is also necessary, thanks to which more new citizens will be born, and new solutions will allow young Poles to “live, work and create here, in their homeland, not on foreign soil”. 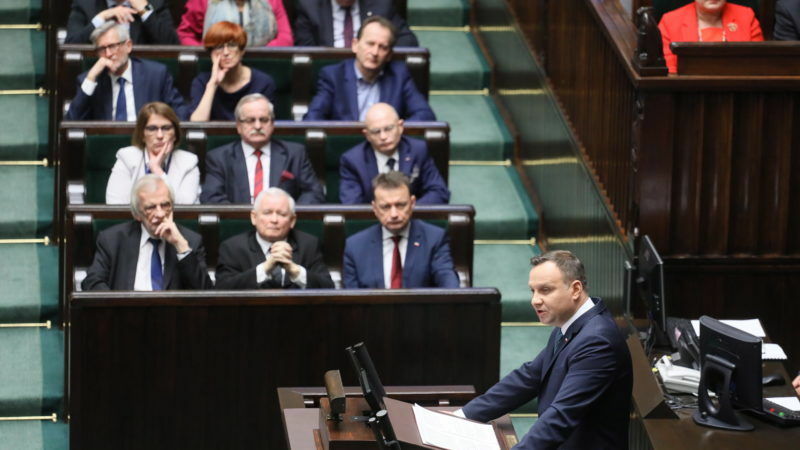 “It’s time for an economic system in which the creativity and dynamism of entrepreneurs – Polish entrepreneurs – will be rewarded, supported and protected,” Duda also said in Tuesday’s address. “But there is also a sphere that grows above everything I have talked about here,” Duda stressed. In his opinion, a “healthy spirit” is needed that unites Poles as a community and makes them want to “last as one nation”. This, he said, was more important than healthy institutions, which – as he explained – “are in a sense the body of a state organism”. “This spirit is our tradition, history, our language and our culture, values ​​that we consider to be common and most important,” the president explained. In his opinion, next year’s jubilee is perhaps the best chance in recent years to rebuild the sense of national community. “Without this awareness, we will not be able to build a modern, just, truly strong state,” Duda emphasised. He expressed confidence that by cooperating, the Poles can make their homeland great. “I know and I am convinced that we will be proud of it. We and those who will talk about it and write for another hundred years. God, bless free, sovereign and independent Poland! God, bless Poles in Poland and around the world,” Duda concluded his speech before the National Assembly.